Located 15 minutes walking from the port in Moyogalpa or 5 minutes by tuk tuk (we’ll even pay for your first ride when you have a reservation with us). Life is good has both dorms and private rooms, all private rooms have an ensuite. With it’s chilled out vibes, open areas, hammocks and fibre optic wifi, it’s the perfect place for you to relax and forget about the rest of the world. 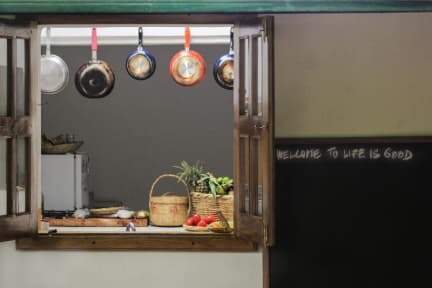 In our kitchen we prepare fresh food, using only local products and recipes from all over the world. Our breakfasts and dinners are some of the best in Nicaragua. We can cater to all your foody needs (vegans, vegetarians and of course meet eaters). You can enjoy a drink from our fully stocked bar of beers and cocktails while sitting on the watchtower and looking over Conception volcano or at the stars of the milky way. We can organise anything you’d like to do while on Isla Ometepe: Motorbike, quad bike and scooter rentals. 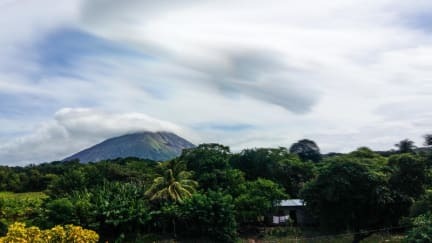 Tours of our two beautiful volcanos (Conception and Maderas), the nature reserve where you can see monkeys and some of the worlds most beautiful butterflies, kayaking through the forest, hiking up the waterfall. Whatever it is, you would like to do, we have you covered. 6 Bed Dorm - The room features 3 bunk beds with an ensuite, lockers, a fan and electrical outlets for each bed. 4 Bed Dorm - The room features 2 bunk beds with lockers, a fan and electrical outlets for each bed and a shared bathroom located next to the room. We offer clean rooms with bathrooms, restaurant with amazing food cooked with love made from fresh local ingredients, bar full of refreshing Nicaraguan beer, good music and atmosphere. Reasonable prices, full service and healthy environment makes your stay unforgettable. Staff is multilingual (EN, ES, Hebrew, GE, RU, SK, CZ). Breakfast not included - 3.00 USD per person per day.